On average, a tire installation takes about 45 minutes to an hour. First, the vehicle comes into a service bay and is placed on a mount to lift it off the ground. The technician will unbolt the lug nuts on each wheel, starting with the left front and moving counter clockwise. Once these are removed, the wheels will be removed from the vehicle. Next, all wheel weights are removed, a new valve stem or TPMS component kit is installed and the new tire is mounted onto the wheel. Once it's balanced, it's reinstalled on the vehicle by using an air gun and torque shaft to limit the torque being applied to the wheel. Then, the vehicle is lowered down so that the wheels are barely touching the ground, and they are torqued again with a torque wrench. The technician will also perform a courtesy vehicle inspection to indentify any other items that may need to be addressed. Protect your investment by getting an alignment. 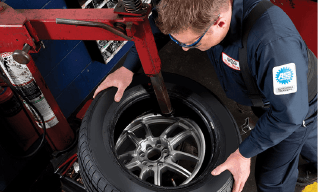 An alignment is recommended so your new tires don't wear unevenly or prematurely. 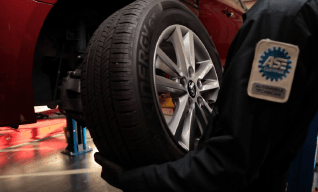 Stop by Pep Boys to learn more about our alignment service packages and warrenties we offer. From information to installation, we've got you covered. For your convenience, schedule an installation at your local Pep Boys on the same day you're ready to purchase your new tires. 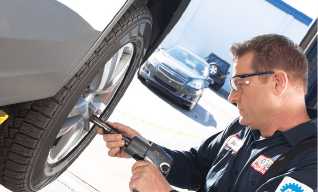 With the Pep Boys installation package, you can enjoy a free tread wear mileage warranty, lifetime tire rotations, air-pressure checks and much more to keep your new tires safe!